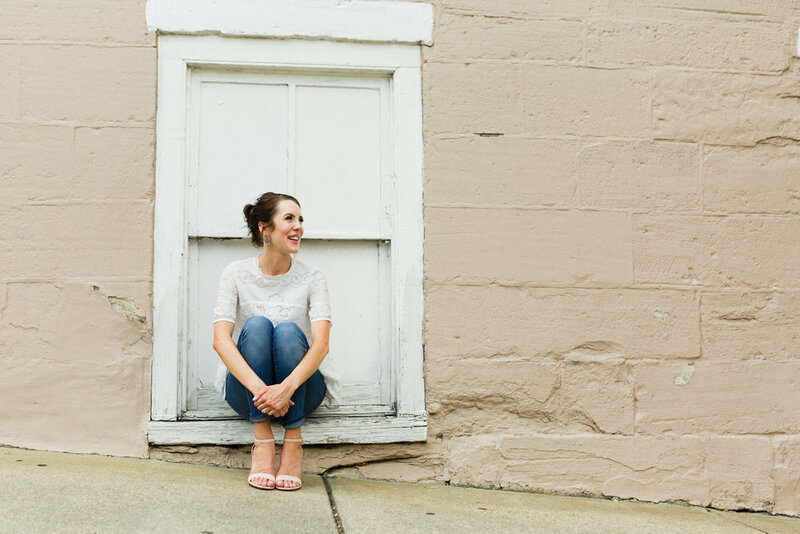 Erika Page is a marketing strategist and blogger living in downtown Fredericksburg, Virginia. She manages social media for the University of Mary Washington and is the founder and editor of Living Dappled, a lifestyle blog for girls and women with vitiligo, a skin condition she’s lived with for twenty years. When she’s not writing, you can find her painting, organizing her closet or shopping for new home décor. You can follow her on Instagram and Twitter. You can read more about Living Dappled on the web, Facebook, and Instagram. 1. Tell us a little bit about who you are and what you do. I’m a 29-year-old newlywed, marketing strategist and blogger living in historic downtown Fredericksburg, Virginia. I have a full-time job running social media for my alma mater, the University of Mary Washington, where I work in content strategy, copywriting and social management. I’m also the founder and editor of Living Dappled, a lifestyle blog for girls with vitiligo, an autoimmune disease that causes loss of pigment and white patches on the skin. I’ve lived with vitiligo since I was seven years old and am now 100% naturally depigmented and write to inspire other women struggling to cope. The thread between both of these jobs is writing and storytelling – I love taking a brand and breaking it down into bite-sized stories that can be told one day at a time. 2. What is a typical day like for you? My day starts later than most people’s – I hit snooze one time at 7 a.m., hop out of bed around 7:10 a.m. and listen to podcasts while I have my coffee and get ready for the day. I’m fortunate to live just a few minutes down the street from my office, so I’m usually at my desk just after 8 a.m. As a social media manager, my days are a mix of attending meetings, researching new trends, writing copy, planning content and monitoring social accounts. I always take a full lunch break, which tends to be a combination of eating and errands – I like to get errands done during the day to keep my evenings clear. My day at the office ends around 5 p.m. and I’m home by 5:15 p.m. Two days a week, my husband and I exercise together – either by going to the gym or going for a run or walk. We always eat dinner together and that’s usually our quality time for the night. Then it’s straight to blogging – I usually blog from 8-10 p.m., writing posts, scheduling social media and catching up on emails. I always end the day with a shower – I can’t stand getting in the sheets dirty! And I’m usually asleep with lights out by 11 p.m. It’s busy! 3. What has your relationship to self-care been like throughout your life? Did you always make it a priority? No – in fact, there was one summer when I went to the doctor five times because I was so burnt out I thought it had to be something more than that. I have an incredibly strong work ethic – I can thank my parents for that – and I thrive when I’m busy and hustling. It’s a fine line though and I easily find myself tipping the scales and burning out. I think my attitude towards self-care has changed a lot in the past few years. My husband is a big part of that change. He’s a work-hard, play-hard guy through and through. I think I was just working hard before I met him, and he helps me remember to take those breaks. This past January, I also came to a more serious realization. I was reflecting on the things that are most important to me in life and among those were my faith, husband, family, friends and my blog. I realized that I can’t be who I need to be to those people if I’m not healthy though – and that’s why self-care matters. Framing it that way in my mind changed the way I see everything I do. Taking the time to meal prep on Sundays used to be a chore – now it’s a self-care practice so I have healthy options at the ready through the week and therefore have more energy to give to the people and things I love. The same applies for reading a book, going for a walk, taking a nap – the list is endless. My days are so busy because I have so much to give to the people around me and on my blog. Self-care by taking care of myself mentally and physically is how I’m able to make all of that happen. 4. What is your favorite self-care practice? Sleeping in! There was a period of time when I would get up as 4:45 a.m. each morning to workout, blog and read before work. If I missed a morning, I would guilt-trip myself until I was back on schedule. Getting up early can be incredibly productive and self-centering. The early hours of the morning are dark, quiet and peaceful – the perfect atmosphere for focusing on yourself and the things you love before the day picks up. But my perfectionist attitude towards productivity left me exhausted and overwhelmed. Unfortunately I’m not one of those people who can sleep just four or five hours a night – I need a solid eight. I used to push my limits, getting less than eight anyway and I would burn out quickly. Now I realize that I can get more done in less hours if I approach my day after a good night of sleep. Today I think of sleeping in the same as going to the gym – it’s part of what I do to take care of myself. 5. Is there any area that you struggle to take care of yourself? How do you want to grow in that area? Yes – I struggle the most with mental stress and anxiety. I think it comes from three things. First, I seem to live in what I’ve heard Arianna Huffington call a “time famine” in her book, Thrive. I mentally approach each day with a feeling that there isn’t enough time in the day – my list always seems bigger than the hours in the day – and that causes undue stress. Second, I’m so driven and motivated that I end up setting high expectations of myself. Those expectations are also often unrealistic, creating anxiety when things don’t go as planned. And third, perhaps tied to those expectations, is that I’m quick to find the negatives in a situation – and fixate on them. When things don’t go well, I’m quick to complain and get upset instead of calmly processing the situation and finding a solution. These things combined lead to a high state of anxiety and underlying stream of stress. It certainly doesn’t set me up for success when I’m going through my day as a wife, sister, daughter, friend, co-worker and blogger. I work to build a more positive mental state in a couple of ways, but unfortunately, I don’t do all of them routinely – which might be my downfall. I have a happiness or gratitude journal full of positivity prompts that I fill out when I need a mental reset. Physically writing out those lists helps me reflect and refocus on the positive aspects of my life. I will also take two minutes in the morning to close my eyes and just breathe. Two minutes may seem short, but it feels like an eternity when I’m doing it. That little window helps me intentionally set a perspective on my day, think about what’s ahead and how I want to approach it. I find that when I start my day with those two minutes, I feel more fulfilled and feel less of a time famine. Last, and most importantly, I try to remember that list I made back in January about what’s truly important to me and let that drive my decisions and reactions. Perhaps I didn’t finish that blog post or do the laundry, but maybe I spent time on the phone talking to my brother or went for a walk with my husband – and that’s way more important at the end of the day. Growing in any area of self-care takes time and intention – it’s a marathon, not a sprint. I’m learning one day at a time. 6. What do you wish you could tell your younger self when it comes to self-care? Two things, actually. First, that self-care isn’t for the weak or lazy. As I mentioned earlier, my parents instilled such a great work ethic in me that I often end up over-working or guilt-tripping myself when I’m not working. Self-care takes times and some forms of self-care require doing nothing – which is counterintuitive to a workaholic. It’s not that I wouldn’t take time to sleep in, explore a hobby or be with friends, but I think there was always a little bit of guilt that came with it. Instead, I should have been feeling guilty for not spending my time on those things! Second, I wish I could have changed my attitude towards self-care earlier, especially when it comes to a healthy diet and exercise. I don’t think I’m alone in saying that I used to think of those things (and still do sometimes) as things I do “because I should” and with a little moaning and groaning. Today I think of them as a choice that I make to take better care of myself, so I can take care of those people and things that I love. I choose to exercise because it releases stress, makes my body stronger and gives me mental space to think. I choose to eat clean because it fuels my body and gives me more energy to get through the day. I’m lucky and blessed to both have the time to put towards those things and to have the financial means to eat that way and have access to things like a gym membership. It’s not a chore – it’s a gift. a. Coffee or tea? Coffee! Coffee is more than caffeine for me – it’s part of my morning ritual. I drink a cup first thing every morning, and have a second in the early afternoon if I need the caffeine boost. b. Current favorite TV show? Not actually watching a show right now, but that leaves time for Grace and Frankie re-runs, my favorite Netflix original of all time. c. Early bird or night owl? Definitely an early bird wanna-be, but a night owl at heart. I struggle to open my eyes and get my brain going in the morning. d. Favorite quote? “Don’t be like the rest of them, darling.” – I had this framed on my wall at one point. It’s both professional and personal for me. From a career-standpoint, it inspires me to dare to think differently and try new things. On a personal level though, it reminds me that having a skin condition that makes you look “different” isn’t a bad thing – it makes me stand out. e. Crunchy or smooth peanut butter? Crunchy! All the way. Thanks, Erika! You can read more about Erika and Living Dappled on the web, Facebook, and Instagram.